If U.S. Sen. Jeff Sessions is confirmed as the nation's next Attorney General, he will oversee an ongoing federal probe into the dangerous, overcrowded conditions of the prisons in his home state. But how Sessions might handle the Department of Justice's investigation into the men's prisons in Alabama is up for speculation. Experts are split on whether the conservative Sessions will get involved in the case, if he'll take a hands-off approach or if he will establish policy that might be lenient on enforcing change. Sessions has granted few, if any, interviews since he was chosen by President-elect Donald Trump as the next Attorney General. A spokesman did not respond to requests for comment. "I won't say there will be a push back (on the state prison probe), but I would assume it would be (handled) different in terms of how they approach it with the new administration," said Doug Jones, a former U.S. Attorney for the Northern District who served from 1997 to 2001. "At this point, you just don't know what the new administration's view of this would be. It is just going to be a different world." Said John Carroll, professor of law at the Cumberland School of Law at Samford University in Birmingham: "The Attorney General sets high level policy. It would be rare for him to go down to the level of these investigations." 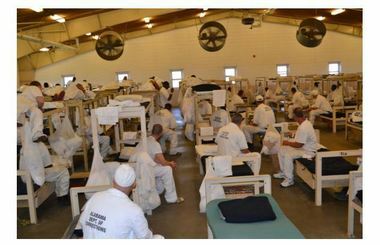 Alabama prisons are the most overcrowded in the nation. They are also understaffed. State task forces and legislative proposals in recent years have tackled the problem, but relief has been slow to come. Instead, the federal government, which once forced California to release prisoners, this year launched a formal investigation into the basic conditions. The Obama Administration's DOJ announced the investigation in October, amid repeated claims about inadequate protections of prisoners who face physical and sexual harm. The notoriously overcrowded prisons are more than 160 percent beyond capacity, and state lawmakers are likely to prioritize plans next year to address the situation, while a federal lawsuit over medical and mental health issues for inmates progresses. The system is plagued with violence against employees and inmates, with alarming situations at Holman Correctional Facility near Atmore: A warden and officer were stabbed during a riot in March, and a corrections officer died after being stabbed by an inmate in September. The recent murder of a Holman correctional officer underlines the dangerous conditions that exist within an Alabama state prison system that has suffered from chronic overcrowding and understaffing in recent years. The DOJ's investigation is being handled under the Civil Rights of Institutionalize Persons Act (CRIPA), which gives the department the authority to investigate violations of prisoners' constitutional rights. Assistant Attorney General Vanita Gupta, who heads the Justice Department's Civil Rights Division, is heading up the probe. But once Trump is inaugurated on Jan. 20, and if Sessions' appointment as Attorney General is confirmed early next year, a new slate of personnel will come on board. Sessions will have the authority to oversee the DOJ's Civil Rights' division, and will be charged with setting administrative policy. Sessions is expected to join Trump for a rare joint public appearance together during a rally Saturday at Ladd-Peebles Stadium in Mobile. But even critics of Sessions' appointment to the AG's post say it's unlikely he would become overly involved in an investigation. Richard Cohen, president of the Southern Poverty Law Center - who has expressed reservations about how a Sessions Justice Department will enforce civil rights laws nationwide - said he doesn't anticipate the Alabama senator getting overly involved with the prison situation. "When it comes to this situation in Alabama, everyone knows that the prison system is in crisis," said Cohen. "Everyone knows it has a mammoth problem of rampant violence and problems of failure to provide adequate health care. It's a clear case of constitutional violations that no Attorney General, no matter where they might be on the political spectrum, will feel any differently on with this case." Said Carroll, "It's universally held even among the most conservative politicians in the state that the prison system has serious issues with it and that it has to be remedied." What will be interesting to watch, according to Jones and others, is how the DOJ under Sessions' watch will handle other criminal justice-related matters that could affect Alabama's overcrowded prisons. Jones said he believes that Sessions, who has had past hardline approaches toward incarcerating criminals - and who once supported legislation that would integrate juvenile prisoners into adult corrections facilities - will likely be "very deferential to the states" on how they handle similar matters. "I don't think he would be the kind of Attorney General to push for interventions if he can see a way around it," said Jones. Stephen Rushin, assistant professor of law at the University of Alabama's School of Law, said he believes a Sessions-led DOJ will be similar to those under President George W. Bush's administration. In other words, Rushing said, an investigation into Alabama's prison won't be altered but the recommendations following it will differ than what could have occurred under a Democratic administration. "Instead of pursuing a consent decree or a court order to force a city or state to effect a change, during the Bush Administration, they provided voluntary assistance of convincing municipalities (and other government agencies) to make changes rather than forcing their hand," Rushin said, noting that Democrat-led DOJ's are more likely to "zealously pursue" federal sanctions on matters of police shooting investigations and prison reform. Rushin also said a key issue to watch is how advanced the investigation has become. "There are time considerations here," he said. "It takes time for an Attorney General, a prominent level Cabinet position, to be confirmed by the Senate." State Sen. Cam Ward, R-Alabaster - and a leading advocate for prison reform in the state - said the DOJ probe will advance "regardless of whether Sessions is appointed or not." "As a state, we've done a pretty good job working with the DOJ in the past," said Ward, adding that Alabama lawmakers are not surprised with the federal investigation that was initiated with assistance from U.S. Attorney's Offices for the Northern, Middle and Southern Districts of Alabama. But Ward said the worry for state lawmakers is over a 2014 lawsuit filed by the SPLC before U.S. District Judge Myron Thompson. The case focuses on a different aspect of the prison system: Mental health, medical care for inmates and discrimination against inmates with disabilities. The state agreed to settle most of the disability claims under a plan that will require improvements in accommodations for prisoners with physical disabilities. A jury trial is underway on the mental health aspects of the case. "That's where Alabama's real danger is, in my opinion," Ward said. Richard Fording, a political science professor at the University of Alabama, said the most effective way for the federal government to force change with Alabama's prisons is through lawsuits filed in the federal court system. He noted that in California, federal courts - with the backing of the U.S. Supreme Court - pushed for the California Department of Corrections and Rehabilitation to reduce its prison population to 137.5 percent of design capacity. In 2015, for the first time in years, the overcrowded prisons were able to meet that threshold. "Federal action generally results from successful lawsuits filed in federal court, based on guarantees offered by the 8th Amendment to the Constitution," Fording said. "Many of the important decisions regarding California's prison system - especially health care - were made by federal judges or other designated federal officials." Meanwhile, Bentley's proposed $800 million borrowing plan to build three new mega-prisons for men and one for women is on hold. The proposal would call for closing many of the existing 15 state prisons in Alabama. Bentley had considered calling state lawmakers back to Montgomery for a special session to address the matter. But there is no indication that the governor's office will move forward with that ahead of the Legislature's regular session that will begin in January. Yasamie August, spokeswoman for Bentley, said it was "premature to speculate" on what "may or may not happen" with the federal investigation pending Sessions' confirmation. She said the governor's office "welcomes" the investigation. Alabama Department of Corrections Commissioner Jeff Dunn did not add anything further to his initial comments about the DOJ probe. He said the department is cooperating fully with federal investigators, and that the state plans to "dedicate the necessary time and resources to enable the investigators to complete their work." He added, "We have been working to provide solutions to the problems faced by the department and will work with the DOJ on recommendations to improve conditions in the Alabama Department of Corrections."